Peterborough will celebrate International Women’s Day this month with a range of campaigns, drama and music. 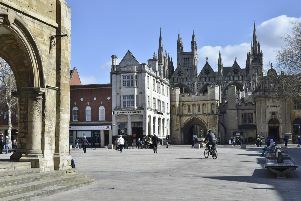 The city will hold the Peterborough Women’s Festival to mark the day, with two weeks of activities taking place. The festival, organised by the Peterborough Trades Union Council, opens on Wednesday February 27 with the city’s Feminist Book Club discussing Virgina Woolf’s Liberty at Chauffeur’s Cottage, home of arts group Metal. This will be followed by the play ‘Votes For Women’ by the Rebellious Sisterhood theatre group at the John Clare Theatre on Friday March 1, before ‘Rouse Ye Women’, a folk ballad about Mary Macarthur and the Women Chainmakers who went on strike in 1910, is hosted by Eastern Angles at the Undercroft in Hampton on March 4. The main event takes place at the Town Hall on March 9, the day after International Women’s Day, when campaigners come together to showcase the work being done to fight for women’s equality. As well as numerous campaign stalls there will be a poetry corner featuring young poets’ work on the subject of feminism, the Bolly Soul dance troupe and food by Resist! Vegan Kitchen. Speakers on the day will include Soarcha Tweedale on transgender rights and the Red Box Project will be asking for donations to fund their campaign for girls to be able to access free sanitary products in schools. The evening will see Eclectic Ballroom take over Lightbox on Bridge Street, with a special all women artist DJ set, Disco Divas. Peterborough Trades Union Secretary Hazel Perry said: “A Women’s Day has been celebrated since 1909 and even today it’s important to celebrate International Women’s Day and the role that women play in society. “It is especially important for Trade Unions to acknowledge women’s issues, as we continue to fight for equality in the workplace. The festival closes on March 14 with the screening of short film at Chauffeur’s Cottage, all made as part of the Cine-Sisters project which has helped women in and around Millfield become filmmakers. For the full timetable search Peterborough Women’s Festival 2019 on Facebook.